Sept. 14, 2018, 2:32 a.m. This time last year Most Honorable came up for the day and we went hiking on the local trails back up behind where I live. We stumbled, vaguely lost upon this house. 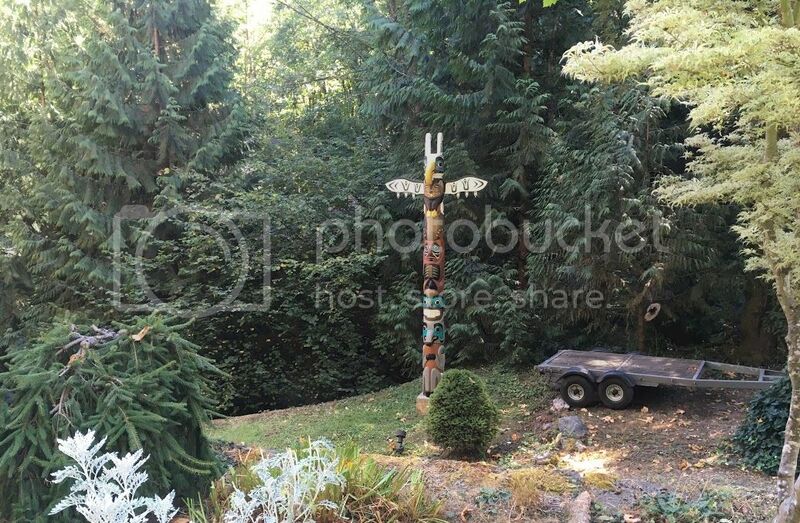 There was a totem pole on the back deck too. One of the neighbors told us that the homeowner makes these modern poles. Last night while I was teaching Most Honorable came up and went to our favorite Mexican restaurant and picked up takeout. We’ve never done that before and it was nifty. So how luxurious is that, to come home to him playing with the cats with one of my favorite meals stashed in the oven to ward off curious felines? A 55 year old experienced woman hiker who parked in the parking lot where we met for the hiking group a few weeks back was killed by a mountain lion recently. She was hiking alone. It was the first death by a mountain lion in the state in a really long time. You can bet your booties I won’t be hiking alone anywhere like that again. The good news is that I have finally, after two months, been cleared to exercise. I actually have an exercise prescription. And I was given a strict limitation. I am not supposed to exercise past a fairly modest intensity. But the plan is with this prescription is that I am supposed to build capacity so that I can exercise more efficiently and over time may be able to run with a group or ride a bike up a hill. Most Honorable came with me for the repeat sports performance test this morning. It was all very intense. There are lots of people involved. But the best part was they ascertained that they had reliable blood work and breathing capacity testing so I didn’t have to have those again! I still had to get wired up with many leads and wear a mask on the treadmill. The more challenging news was that I heard loud and clear many times in many ways that I have heart disease. And that is what has been stopping me from doing these things I want to do. Houston, we have an answer. What is interesting is that I never would have known this had I not pursued this line of testing. And seriously thank the trees and the stars above that I made the decision to stop smoking 32 years ago, and started exercising regularly and be temperate in my dietary habits. The professor of sports physiology that we met today who has been behind the scenes in this was quite emphatic about a bunch of stuff that I need to do to stay healthy and it was kind of like taking a crash course in heart physiology. They want to do, ordered more blood work and then I will see someone, one of the other doctors to prescribe the statins. A low dose. I took the rest of the day off. Went out and walked/jogged the track and have been puttering around. I am taking tomorrow off too! Yippee. I am trying to absorb all this. And am trying to imagine what this kind of diagnosis would be for someone who is sedentary and doesn’t have a habit of being active. The drugs, the diet, the exercise that is basically now a requirement for staying healthy and not having to have any interventional procedures. After all that I got this very unexpected answer. They told me it is the luck of the draw and I have “bad” genes. I already knew that because I have a genetic anomaly that I have been living with since I was 17. After I was treated for that is when I learned that to be free of discomfort I needed to exercise regularly and take good care of myself and ironically that diagnosis and the action I took to deal with that diagnosis may very well have saved my life with this one. Talk about silver linings. Wow. You just never know. And it's maybe a good job we don't! It must be a lot to take in but there may perhaps be some relief in having a definitive answer I would imagine? You can do everything right and the genes still outweigh it all in some cases. I know you are happy to start exercising again. Take care of yourself. Thank you. I am! My cholesterol levels are in the normal range but they are telling me I have to be super vigilant about it. I'm glad to hear you have some answers and a path ahead. All those things that you do have stood you in good stead.